Tonk is a rising hard rock act from Canberra, Australia, whose style may be more in common with their post grunge, modern hard rock peers in America. The first and only full-length release (so far), Sister Switchblade, debuted in their native land in 2007. It's being reviewed here because Tonk is trying to break into the UK this month, so a little push in the States couldn't hurt. Immediately upon listening to Sister Switchblade, three good traits are heard: crisp production, talented musicianship, and strong performance. I have little doubt when Tonk hit the studio for his one they were sweating blood and the knobs were turned to eleven. Guitarists Steve Gray and Wayne Withers (who seems to have been replaced as of this review) are proficient and rarely derivative in delivery: take note of Golden Girl or Needle In The Red. Jinks' vocal performance may be best described as full volume brash and explosive. Musically, arrangements can sound modern like the opener Redback to straight up groove-laden melodic heavy rock as on Looze Yer Load or Sister Switchblade. Conversely, Sister Switchblade suffers from lyrical redundancy; its all women, looser women, wild times with the boys and, did I say, loose women. And this is generally emphasized with the regular vulgarity native to modern rock these days. Yawn. Nickelback already exits. Additionally, though welcome for its intensity and acoustic impact, the constant heaviness causes Sister Switchblade to implode in upon itself. Except for the likes of Libertine or Stay which turn on less oppressive more melodic arrangements, most times Tonk is ramming their music down your eardrums. A little more diversity would be more interesting. 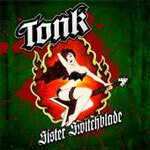 Despite these caveats, overall, I was quite impressed by Tonk's hard rock on Sister Switchblade. Australia's Tonk and their most recent work, Sister Switchblade, delivers impressive melodic, near modern, heavy rock characterized by skilled musicianship and high energy, and weakened only by its repetitive heaviness and predictable lyrical themes. Even with these downturns, Sister Switchblade is a solid effort which I can recommend for fans of current modern hard rock trends. Australia's Tonk and their most recent work, Sister Switchblade, delivers impressive melodic, near modern, heavy rock characterized by skilled musicianship and high energy, and weakened only by its repetitive heaviness and predictable lyrical themes. Even with the latter, Sister Switchblade is a solid effort I can recommend for fans of current modern hard rock trends.